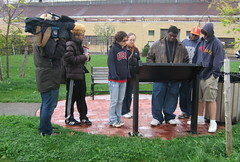 This morning I had the opportunity to participate in the Buffalo Youth Media Institute sponsored by Squeaky Wheel. 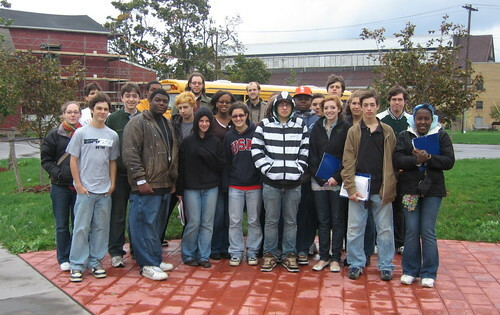 Twenty teens from the area - half urban/sub-urban - boarded a school bus and experienced the city, raw and unfiltered. 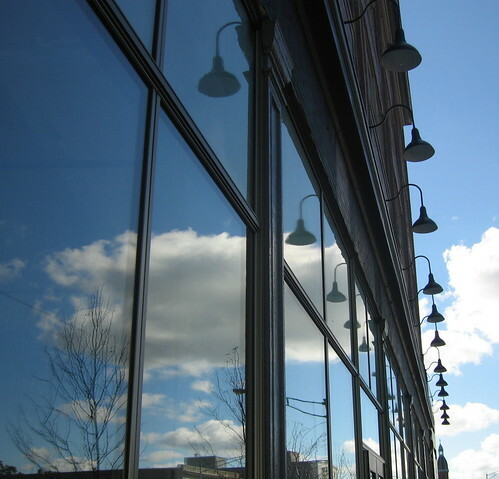 This year's program will focus on Buffalo's East Side. Youth producers will study the history, architecture, culture and civic issues of this overlooked neighborhood and make self-directed documentaries based on their own research and interests. 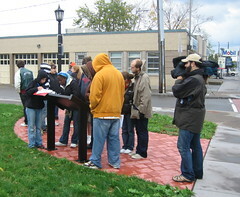 The East Side tour was bracketed by the 'new' - Artspace and the Michigan Street Heritage Corridor. The other stuff, total dereliction: St. Vincent's - German Roman Catholic Orphan Home - Transfiguration - Central Terminal. We made an unscheduled stop along Paderweski Street where we admired some city-owned trash filled and burned out houses right across the street from the recently remodeled Harriet Tubman School. I'll follow the development of these documentaries over the next several months and eventually make them available here, too. Dorthea Braemer passed along copies of student work from the past two years. Will get that on-line soon. 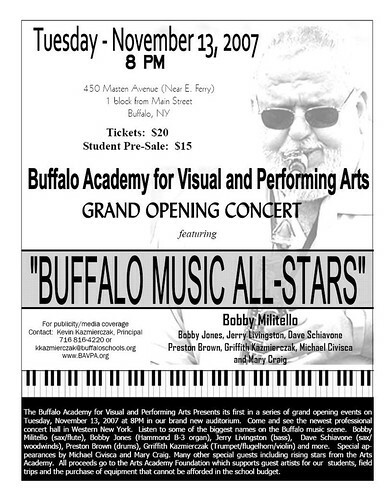 And make sure to check out the Buffalo Youth Media on MySpace! 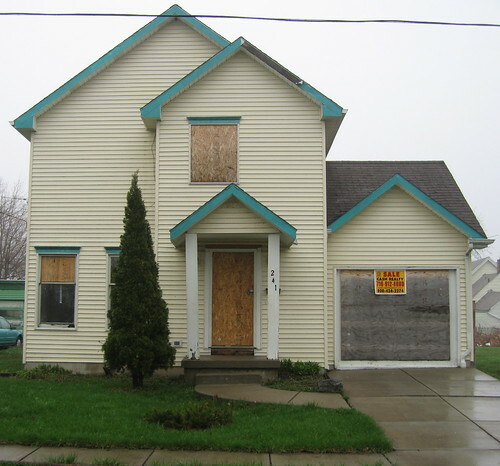 Frequent fixBuffalo readers may remember the unsettling series of posts - Tale of Two Cities - where i've been tracking how the City priortizes residential demolitions on the east side v. west side. Earlier this afternoon I noticed that 198 Glenwood finally came down five years after a fire destroyed the house. Neighbors told me it happened earlier in the week. Just around the corner 349 Masten was demolished this past week, too. First profiled it here - Theater of the Absurd - as it was located directly across the street from the Paul Robeson Theater and African American Cultural Center. 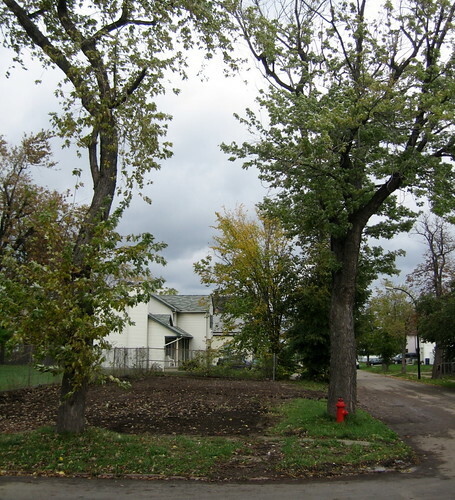 Both properties - 198 Glenwood and 349 Masten - were located just steps away from City schools. Years later, they come down. Why the wait? Remember Byron's letter from last month - Dear Friend? Pathetic, I know. fixBuffalo fan just tipped me off to the following story in today's Buffalo News. Buffalo’s control board is getting two new watchdogs — a longtime Niagara County banker and the head of one of Buffalo’s largest charitable foundations. I've been following some of Rev. Stenhouse's work around the neighborhood for awhile. City of Buffalo v. Richard Stenhouse for all sorts of background. Those houses are still wide open and totally derelict. Just around the corner, this house at 121 Woodlawn Avenue is being re-done for a second time in the last five years by Rev. 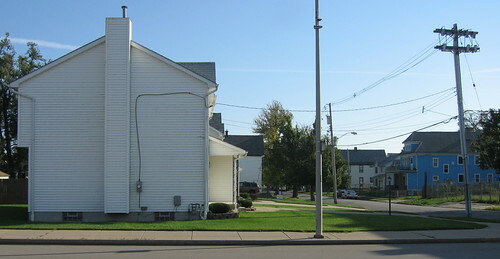 Stenhouse's organization, Bethel CDC. Up untill recently it was wide open and sits directly across the street from the new 35m Arts Academy. Received an email this morning from Anthony Armstrong over at LISC-Buffalo. Anthony is following the number trail and keeping track of recently released demographic trends here in Buffalo using USPS data about undeliverable mail. Totally chilling. Click here for larger map on left and here for map on right. Go ahead. 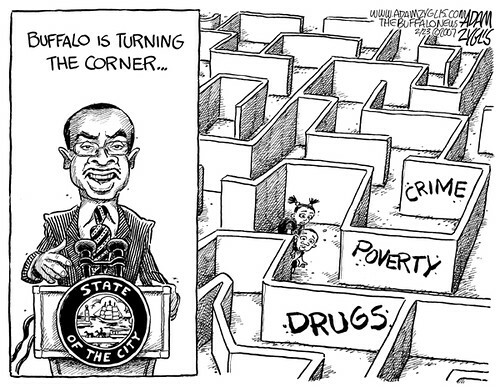 Pick out your census tract and see what's really happening here in Buffalo. Both maps here represent some pretty serious demographic trends. First map represents what's happening at the end of September 2007. The second map compares 2006 and 2007 third quarter trends. Serious evidence about the 'hollowing out' of our neighborhoods. The USPS has been sharing this data since the first quarter (the period of January 1 – March 31) of 2006 (Q1 2006), providing for a year-to-year comparison of current vacancy trends. However, longer term historical change cannot be derived from this data set. The data continues to reflect the uneven market conditions across the city. While some areas experienced a large number of new vacancies, other areas remained stable or experienced an increase in addresses in service. However, as the above statistics show, the aggregate gains are outweighed by the aggregate losses. 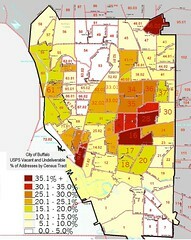 For example, the district roughly bounded to the west by Fillmore Avenue, Bailey Avenue to the east, to the north by East Delevan and the south by Clinton Street, has shown a significant decline, with some tracts showing a year-over-year decrease in deliverable addresses in excess of 10% and overall vacancy rates of nearly 40%. I've placed the corresponding data set in downloadable format right here that reveals trends in Buffalo by planning area from January 2006 - September 2007. Readers here may remember some of LISC's heavy lifting last year that I wrote Getting Smarter about Decline, last November. 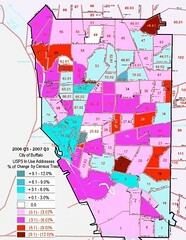 I posted about Anthony's analysis of Postal Service data - No One is Home - in May 2007 when I first looked at this on going study. Shrinking Buffalo has some valuable links if you're still in denial. Buffalo, NY finds it's way into some national press once again. Just saw this - Can Buffalo Ever Come Back? - in The New York Sun by Harvard University's Edward Glaeser. 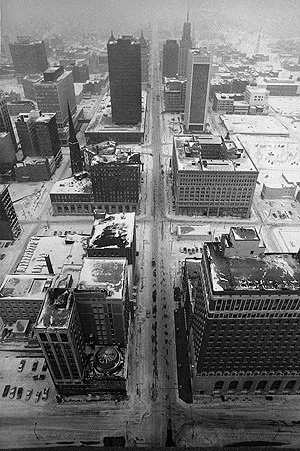 At the onset of the Great Depression, Buffalo had 573,000 inhabitants, making it the 13th-largest city in America. 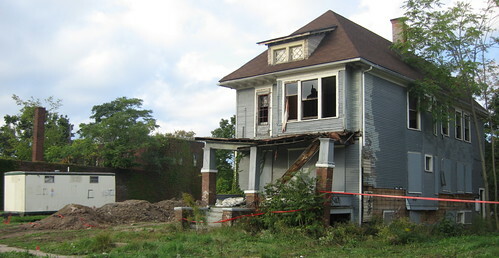 In the 75 years that followed, this once-mighty metropolis lost 55% of its population, a decline most dramatic in its blighted inner city but also apparent in its broader metropolitan area, one of the 20 most quickly deteriorating such regions in the nation. 27% of Buffalo's residents are poor, more than twice the national average...read the rest. I've been interested in the work of Edward Glaeser for a few years where he explores the intersection of poverty and the built environment. Here, the last section of this article is particularly resonant. The best scenario would be for Buffalo to become a much smaller but more vibrant community—shrinking to greatness, in effect. Far better that outcome than wasting yet more effort and resources on the foolish project of restoring the City of Light's past glory. fixBuffalo readers no doubt will remember this related piece Richard Florida v. Buffalo, NY from last year and of course Beaten Down Buffalo from New York Times reporter Ken Belson last month. While out walking the Artspace neighborhood this morning, I grabbed a photo series over at 94 Northampton, one block away. Here's the slide show - 94 Northampton - and links to my earlier posts - Going, Going... If the place is worth saving...what's the next step? 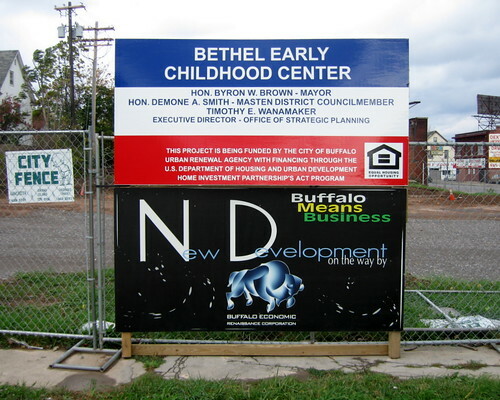 Newest blog in Buffalo belongs to Paul Wolf, Chief of Staff for Buffalo's Common Council. Buffalo Ideas is Paul's blog. Noticed that new granite curbs were off-loaded earlier in the week here on Woodlawn Avenue. Some of the infrastructure here on Woodlawn Avenue, directly across the street from the new Arts Academy, will be replaced. All sorts of little flags here this week outling the scope of the project. About two years ago a few of the intersections were upgraded, too - here - and both Michigan and Masten Avenues were turned back to two-way traffic. 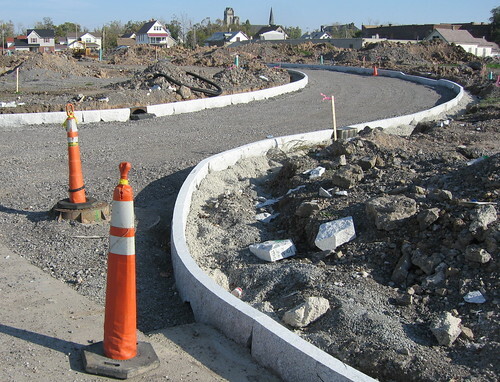 During the summer of 2006, a few major repaving projects a few blocks further down Woodlawn - here. In the most serendipitous way the first chapter of, Across an Inland Sea: Writing in Place from Buffalo to Berlin (2003) by Nicholas Howe appeared in my inbox over the weekend. That link will take you to the full text of Howe's first chapter, Buffalo and Beyond. Howe's writing is perhaps the most meditative, mythical and at times poignant account of Buffalo, the influences that have created some of the most amazing and breathtaking moments in our path - both past and present. Part of this blogging has always been a way for me to understand this place. Howe's writing helps. I've added the full text of Howe's first chapter - here, pdf file - to a collection of works that I've previously called, Writing the City. Stuff you should know if you know Buffalo. Nicholas Howe passed away last year. His father, Irving Howe created and edited Dissent Magazine. Good read. 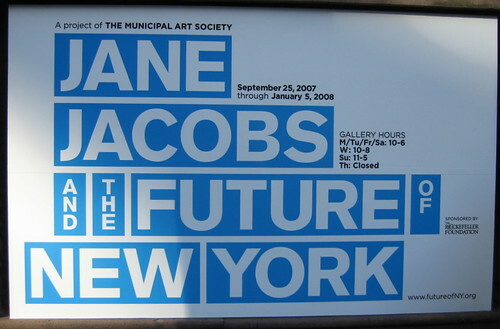 Recently I had the opportunity to check out Jane Jacobs and the Future of New York, a tribute to the life and work of Jane Jacobs. First started writing about Jane's work a few years ago and last year here - Jane Jacobs (1916-2006). The entire site - Jane Jacobs and the Future of New York - is really resource rich. I know, New York is 400 miles and an hour away and simultaneously closer and further away than we usually think. Last time I mentioned anything about the City was over here - back wednesday - when I linked to the work of Camilo José Vergara, especially these two short clips reflecting his take on the World Trade Center. Check out the exhibit next time you're in the City. Runs 'till 1/5/08. Americans are demanding new choices about where and how they live. 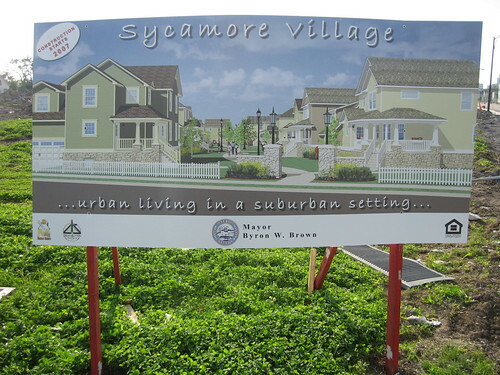 For the past 50 years drivable suburbanism has been the norm, coupled with decaying central cities. But that familiar pattern is reversing, in part, thanks to our two guests this week. John Talmage runs Social Compact, an organization that is uncovering the numbers that show inner city neighborhoods have far more people and far more buying power than official counts suggest. And he is helping cities capitalize on that with revitalization. Prior to joining Social Compact, John served as the Deputy Director for Economic Development for the City of New Orleans. I had a couple very cordial phone messages from Bill Trezevant this week. He invited me over to take a look at the progress that he was making at Transfiguration Church. After 14 years looks like something's happening. I heard from a few members of the City's Preservation Board that Transfiguration Church is on the agenda for the board's meeting on Thursday, 10/18. 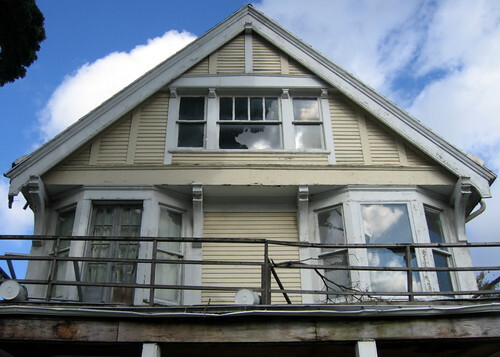 Allow for the emergency repairs to include the removal of slate and replace with plywood where necessary; Install "peel and seal" where slate shingles are missing. 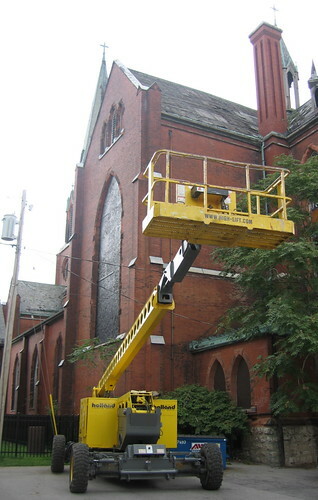 Use a man life and hook ladders over the peak and contractor will brace the rafters. 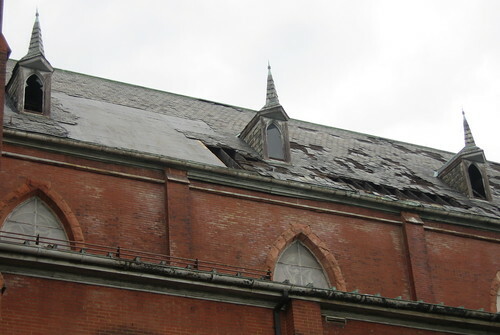 These repairs are for the main roof only with the steeple still being a concern. All slate removed will be stored in the Church. I'll be tracking the progress, reporting it here...stay tuned. 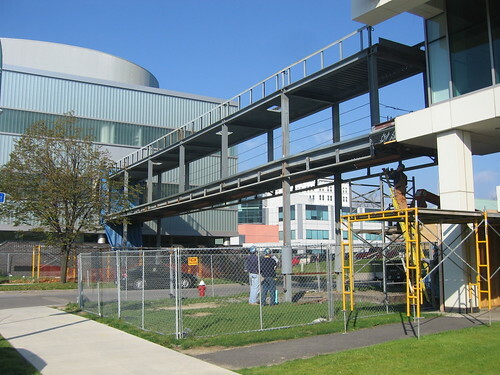 fixBuffalo readers may remember this slide show and post - Biting the Dust - from April 2006. 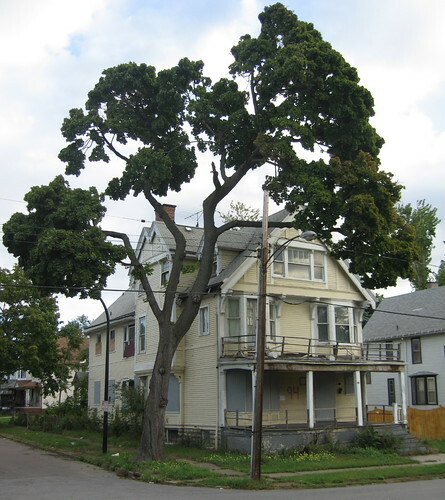 Recently, Micheal Gainer - Buffalo ReUse - and Rod McCallum - Queen City Farm - teamed up to secure the Engel House here at 194 East Utica. 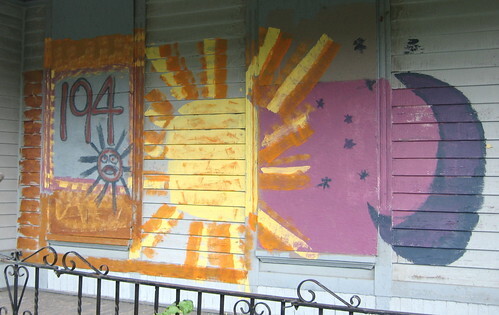 We'd met earlier in the summer to paint what's sure to become a new way of looking at and securing some of the abandoned and partially boarded houses here on the City's near East side. 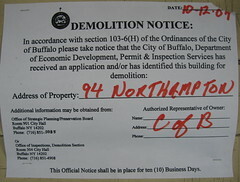 Heard late last week that Buffalo ReUse is relocating to the neighborhood, too - right here - on Northampton Street. A neighborhood emerging...at last! 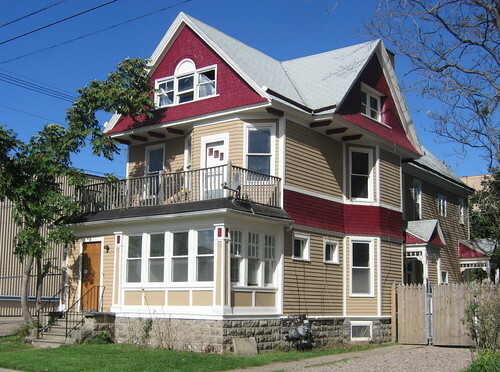 Located at 94 Northampton - a block from Artspace - this house has recently been released by MBBA and has reverted back to the City of Buffalo. Saw the red mark of death on Saturday morning! I first posted about this spot in January 2007 - Saturday Surprise, 100 Years Ago - when Joyce showed up with a picture of her family's house from 1906. 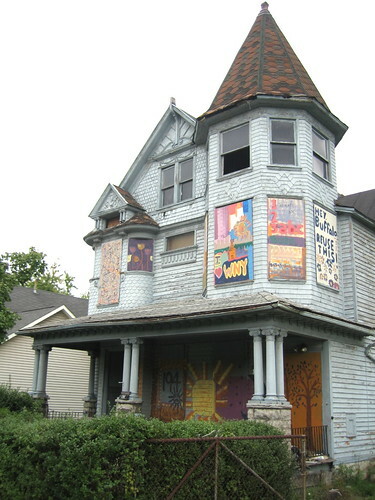 Hands down this is one of the most amazing houses on the City's near East side. 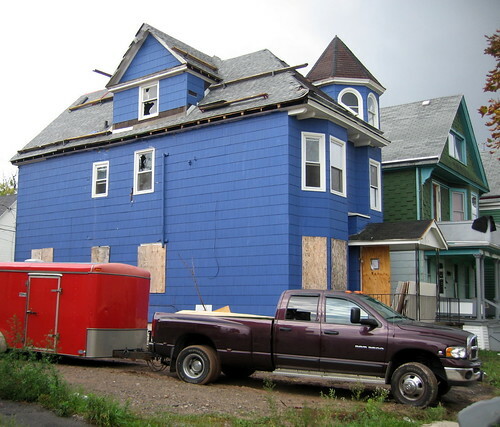 Like the Queen City Farm House at 194 East Utica that was placed on the local radar last year, I'd encourage any fixBuffalo reader to imagine what it would take to get a project such as 94 Northampton off the ground and completed. 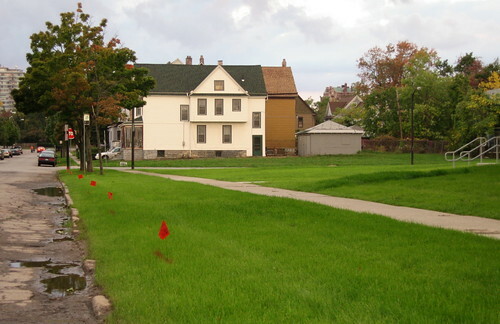 Frequent fixBuffalo readers may remember the campaign to save the Hamiltion Ward House here at 19 Coe Place during the summer of 2006. Amazing display of sustained community pressure to convince the owner - Belmont Shelter - to do the right thing. Geoff Kelly's Artvoice cover story no doubt finally galvanized the importance of saving this place from parking lot hell. Today i had the very unique opportunity again to get to the top of Midtown and grab that snap. All sorts of work - new roof, siding and all sorts of interior work has already begun. 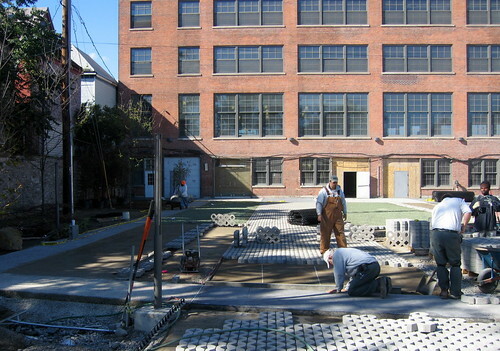 Will be following this project 'till someone moves in to the Hamilton Ward House. Huge thanks to Liz and Mike over at Belmont for doing the right thing. I first mentioned 38 Northampton in April 2006 - Investment Impact - and was totally wowed that list to sell time was less than 60 days! Noticed the new paint job this week. What's of course important to remember is that this house sit's directly across the street from the Northampton Street entrance to Artspace. Other anecdotal evidence of this part of the city's near east side turning is the recent sale of 10 Edna Place, just around the corner from Artspace in less than 30 days! Additonal signs of private sector investment in this neighborhood include the brand new roof over here at 91 Northampton. Ok...three houses, about a block away from Artspace, not quite a trend (?) yet the water's getting alot warmer over here. Come on over and check things out. 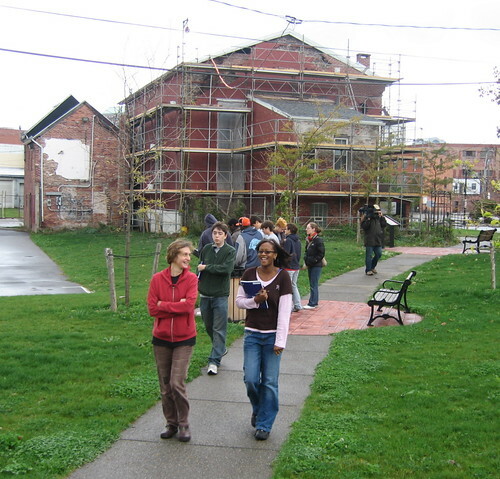 Neighborhood tours every Saturday morning at 11am, leaving from the Sonic Café. Noticed a few changes this morning over at Artspace. Landscaping behind the Main Street building. And new lighting in the front. Recently sat down with Bryan Day from Belmont Shelter over at the Sonic Café to discuss a number of neighborhood concerns and the latest rental information. Get in touch with Bryan if you're interested in one of the new spaces in the back. He can be reached at 884-8026. I pass by here a few times during the and night. Imagine this place will really start buzzing when the new lofts are occupied. First started writing about 1466 Michigan Avenue years ago. It's the view looking out my office window down Michigan Avenue. 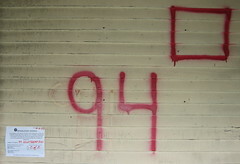 The construction trailer showed up this week and all the red-tape associated with asbestos abatement did too. I've written before that 1466 got a new roof about seven years ago and the last time I ventured inside thought it was actually in pretty good shape structurally. Oh well, rather than properly board and secure this place, seems like City hall has placed their sights on spending another 25k or so for a mindless demolition. Not that demolitions are a bad thing. Yet here in Buffalo we use the scatter shot approach, i mean there's no strategy. When I started this little neighborhood blog three years ago - October 2004 - I could not have imagined the response, reaction and readership that I've received. I've met some amazing and totally tuned in people that i could have only met here because of this little neighborhood blog. Yet, I'm continuously reminded of the need for a sustained critique of this place. Sure it's raw, very quiet and increasingly more vacant and as at one new fixBuffalo fan has commented - Buffalo resembles New York City in the 70's more than any other place they've been. 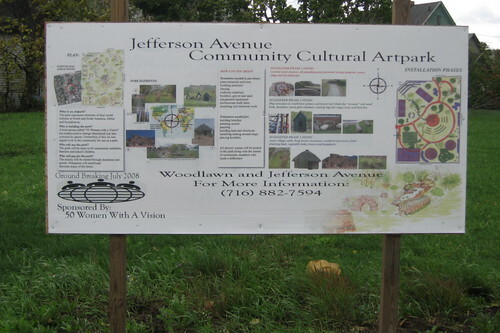 Significant development here in this neighborhood on the City's near East side - including the Merriweather Library, Artspace and the new Arts Academy - since I started blogging, which is all really amazing. Yet the persistant wholesale hollowing out of the neighborhoods, backed up by recent Postal Service data referencing trends in undeliverable addresses is not getting the attention in the local 'sphere or print media. Wrote about it - Undeliverable, "No One Home" - in May. 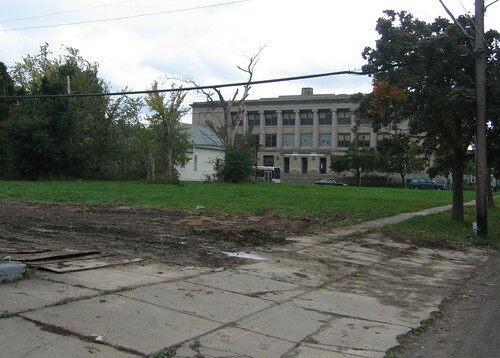 Just heard from another fixBuffalo reader that only NO one from the City of Buffalo - the people that need this the most - attended the recent ReClaiming Conference sponsored by the National Vacant Properties Campaign, last week in Pittsburgh. Heavily attended by folks from other cities. After three years, I've decided to take a break from the regular and resource rich posting that many of my readers have come to expect. 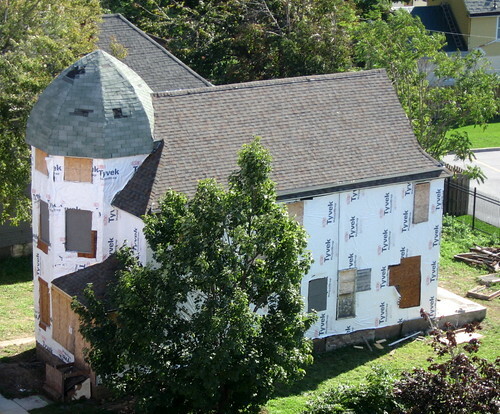 I'll probably sneak in few posts as there are some significant new developments with Transfiguration Church and over on Coe Place and will keep tabs on the Woodlawn Row House which were just sold at auction, too. I'll be back soon, I'm sure with a slightly different take on what's still (not) happening here in Buffalo. This may include some extended work on a variety of macro issues - Buffalo as decentralized back-office and a critical (re) examination and role of the Albright-Knox in developing Buffalo as part of the expanding global art scene. Buffalo as exurb for expanding population of the Niagara Peninsula and Toronto as well as pied-a-tier for New York crowd all augurs well for the future here and represent a few of the strategic advantages that may push the agenda forward. You can interviews and podcasts that intersect the artistic, cultural and political agenda of the people who desire to make Buffalo home - for four days or forever.